I had seen the film twice in theaters and immensely enjoyed the 3D; which I thought was the best I had seen and that includes James Cameron’s Avatar. Watching the film without the 3D was not as awkward as I thought it would be but that is because Scorsese didn’t shoot this to be a “Hey look, my film is in 3D!!”. The movie is shot extremely well with its Mise-en-Scene set up so that the 3D enhances the film instead of it being used as a gag. That said the film stands well alone in its 2D format. The film is about a young orphan named Hugo, played by Asa Butterfield, who lives and works in a French train station. With his father deceased he is left to carry on in their final project; rebuilding a old, rusty Automaton. In his quest to rebuild the machine he clashes with a local store owner Georges Méliès, played by Ben Kingsley. 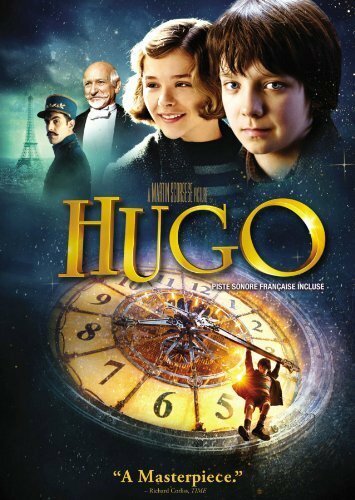 Hugo’s future is entangled with Méliès’ past as it is his machine that Hugo is repairing. Trying to figure out why Méliès has such a distain for Hugo, Hugo alongside Méliès’ god daughter Isabelle, played by Chloë Grace Moretz, embark on an adventure. Their journey leads them to the discovery that Méliès was once a very famous filmmaker but overtime his popularity faded because of The Great War and shortly thereafter he became a distant memory. Scorsese’s love of cinema is greatly apparent during flashbacks and montages of the old cinema days; it’s one aspect of the film that I greatly enjoyed. Considered the founding father of narrative story telling Georges Méliès was the first individual to use film as we know it today, to bring dreams to life. The story of his life is pretty much the same as in the film; a famous filmmaker whose life bottoms out and gives up only to be ”found” later. He recognized the tricks that can be used in cinema from quick cuts, movement and space that could create a world of wonders In today’s world anyone can pick up a camera and tell a story but Méliès was an innovator. He had no knowledge of anything he created everything we see today just was by trial and error. With interviews with Méliès’ great great granddaughter she explains that he was just a giant child looking for ways to have fun. Making over 500 films in his career, once his life hit rock bottom Méliès was discovered in the train station by another shop owner and the events that follow are reminiscent to Hugo. This is a short yet great piece as it showcases the talents of Georges Méliès and the marvels he brought to cinema. The automaton is an important part to the film as it is what brings the story together. This extra offers an historical account of the automatons from the early civilizations in Rome to today. Automatons uses ranged from doing simple tasks to playing instruments and offering entertainment. Georges Méliès used automatons during his magic act and the one in the film is closely related to an existing one that wrote and drew pictures. Their internal workings are extremely complicated and referred to as almost human like. It goes back to the wonderment of “how is that possible?” and to expand our ways of thinking. This goes over the dream sequence scene that Hugo has when a train goes off the tracks and crashes though the station. All the sets and trains were built within a month. The scene is based on an actual event that happened and the real picture is in the book by Brian Selznick. This was an amazing piece where you can appreciate all the hard work that goes into such a short scene. This is a quirky little gag piece that offers insight to Sacha… The Actor; with a Borat / Bruno spin to it. It’s a quick bit and a fun one at that. The audio is crisp, especially during scenes in the train station where you can hear all the little nuances of the travelers and shop owners. The video is crystal clear and for a film shot in 3D does not feel like a gimmick or hokey viewing.